This is the moment a pastor was allegedly caught watching a twerking video in church. 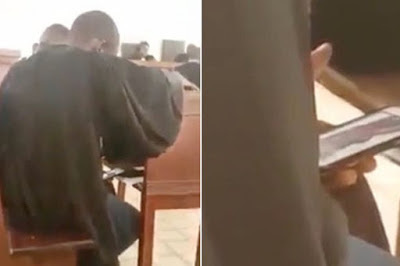 The man was filmed sitting in a pew, wearing a gown and holding a smartphone in his hand. There were several people seated around him. The person filming zoomed in to see what was on his phone. The screen appeared to show a woman twerking. The female was apparently filmed from behind, wiggling her bottom at the camera. She did not seem to have many clothes on, if any at all. In the footage, the pastor appears fixated with the woman gyrating on his handset. The video lasts 45 seconds and he doesn't look away. It is unknown where the church was located.